← Many Homeless in Sweden Have Animal Companions. Sleeping Bags and Dog Food Are Needed. Allegra was born a wild mustang of very special lineage. Wind Horse Foundation is Allegra’s permanent home and is under the care of Anne-Marie Pinter. Anne-Marie competed in the Endurance circuit for many years with great success on her gelding Montana. She competed in and finished the Tevis twice, once when Montana was 11 agian when he was 19. She has raised, trained and ridden horses for dressage and trail riding. 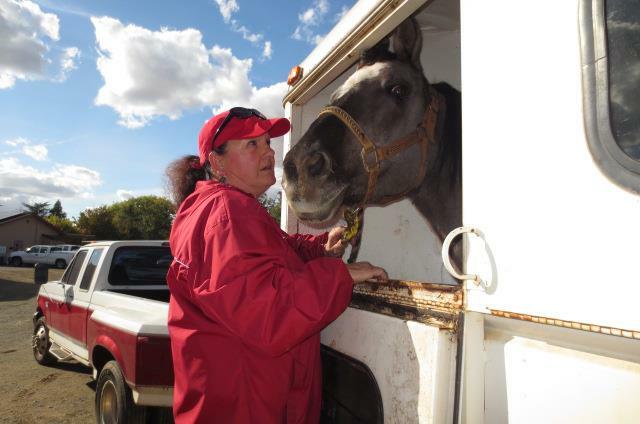 Wind Horse Foundation is a relatively new non-profit but Anne Marie Pinter has been a horse woman all her life. Wind Horse Foundation now has 12 Spanish Barb mustangs in their herd; 6 recently came down with pigeon fever. Allegra is the only one who has not improved as a result of her shyness and fear of people. Anne-Marie lost her job during the peak of this illness because she decided to stay home to care for her sick herd. 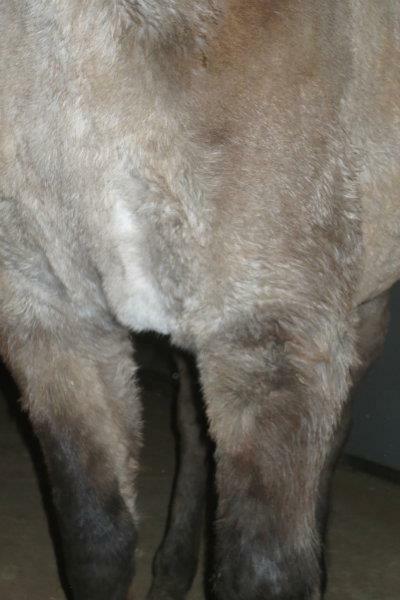 As a result, all the foundation’s and Anne-Marie’s personal resources have used up to pay for veterinary care. Some fans and friends have gotten together to raise funds for the medical costs for Allegra’s and the other 5 mustangs afflicted with pigeon fever. PHONE 916.652.7645 TO MAKE A CREDIT CARD PAYMENT OVER PHONE. UPDATE FROM THE VETERINATIAN AS OF 10/24/2012 1:50 A.M. EST. 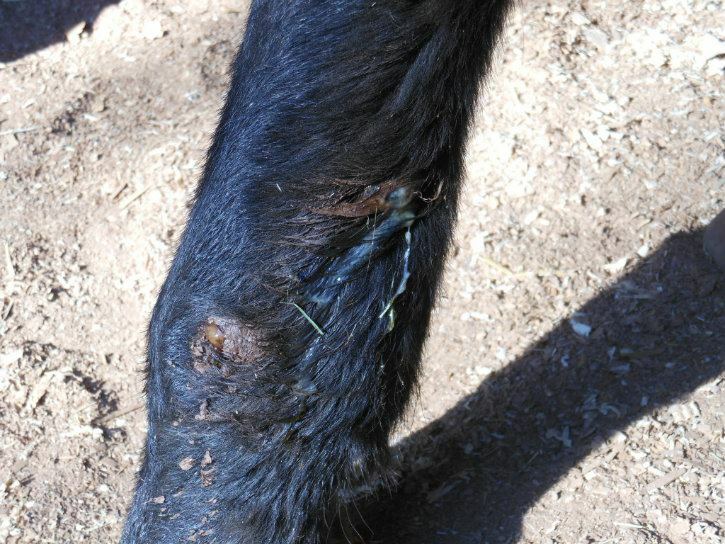 ….. ALLEGRA IS quite serious because she has two abscesses measuring 2-2.5″ diameter, and the bacteria is in the skin as well on her left neck, the weepy sore. Dr Fielding is concerned that it is going to her lymph nodes at the back of her throat; she has been coughing. She was started some super strong broad spectrum antibiotic, has an IV cath, was medicated for pain, and is scheduled to have surgery tomorrow. Anne-Marie will be present and will keep us posted. She had a conversation with Dr. Fielding and told him that if at any time he feels that the disease is too advanced then Allegra will be euthanized with Anne-Marie present. We sure hope it won’t come to that because she is a real tough little mare and has been trying so hard to open up and trust more. It is heart wrenching to watch. 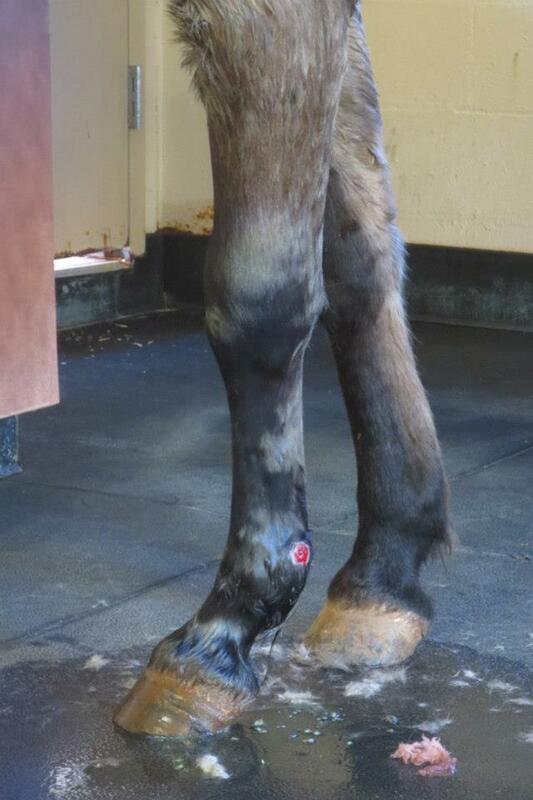 If all goes well she needs to stay in the clinic for 10 days on the antibiotics and wound care. Looking at $2000+ ……the price of a life….God Bless you for all of your help! Every Mustang has a story here at WHF. We are working on a facebook page and updating our web page to tell all their stories and the happy endings. Allegra’s lineage is of Spanish Mustangs. She was born in Oregon and sold to a rancher in Washington. When I saw her first, she was on a breeding lease to a fancy dressage barn in northern California to be bred to their imported black Lipizan stallion because her owner liked her Grulla color. My first thought was she is beautiful! I sensed from the start that she was very sensitive and afraid of people. 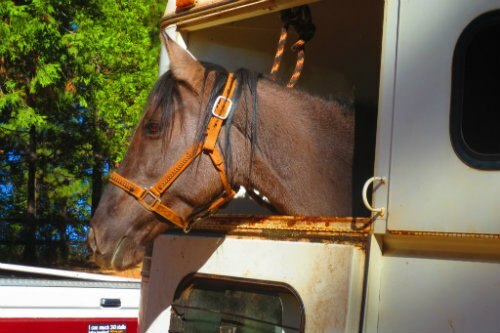 The person who leased her was a trainer and promised to work with her…..however that never happened. I visited her and saw as she was moved to the back of the stable and referred to as “that little wild mustang mare”. She was drugged for breeding……after that it was hard to approach her with a syringe. I tried educating the woman about Mustangs and Spanish Barb Mustangs, to no avail. I decided to purchase her. Not wanting to step into a complicated lease agreement between the owner and lessee, I put half down and agreed to wait until she had her foal and it was properly weaned. Poor Allegra had her first foal a month early out in a dirty back pasture of the fancy barn all alone. I rushed over to see them in the afternoon and I saw a baby in distress, she had septicemia. Allegra knew her baby was in trouble, nudging the little filly with her nose then hesitantly coming towards us, as if saying: “please help my baby”. The owner of the stallion immediately took them to U.C. Davis Equine, and the filly, named Sueno recovered. Allegra and Sueno have never been socialized. Sueno was abruptly taken away from Allegra and put in with a herd of youngsters aged 6 months to 3 years. Needless to say they ran her to death. She was found down with a broken neck the following day! I was completely upset and decided to take Allegra immediately. By that time she was 8-9 months pregnant. The owner then tried to double cross me to get the foal she was carrying, however there was no way I was going to allow that to happen! I paid the other half of the purchase price and moved her immediately. To make a long story short, Allegra foaled on June 15th, her due date; she delivered twin fillies, one stillborn. I was furious, because the owner of the stallion remarked, “…oh I could have had 6 set of twins.” However she never did an ultrasound on Allegra. Allegra could have died in delivery the vet said. The tiny filly survived with around the clock care, and became a 15+Hand beautiful mare named Milagros. Allegra and Millagros had been together for about 10 yrs before Milagros went to live and be cherished by my good friend, Alice in Oregon, who does dressage and trail riding with her. Allegra has never been sick a day in her life until now… I feel she deserves a chance…and I am so very grateful that with all the outpouring of love and donations, she will have that chance now! Allegra needs your prayers and healing energy this afternoon around 2pm she is having surgery on her chest for the two huge abscesses. Posted on October 24, 2012, in Fund Raising For Animals Emergencies. 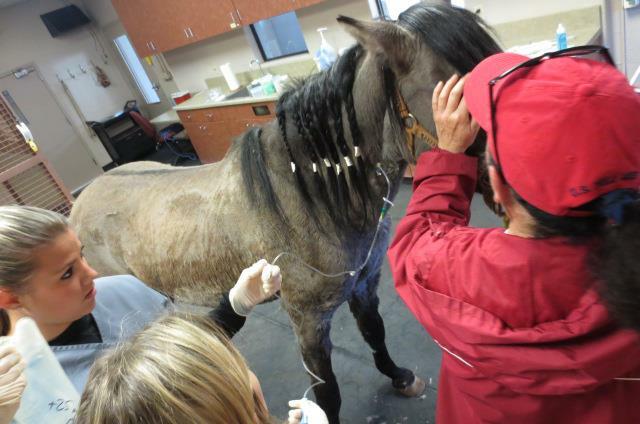 and tagged Allegra, Anne-Marie Pinter, LOOMIS BASIN EQUINE MEDICAL CENTER, pigeon fever, Spanish Barb Mustangs, Tevis, Wind Horse Foundation. Bookmark the permalink. 6 Comments. 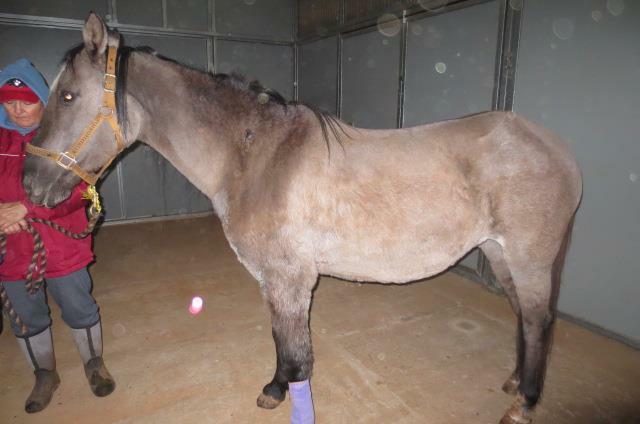 Please share this blog with your horse loving friends… Wind Horse Foundationcould really use the help right now! Allegra is happy to be home and is improving rapidly, both pysically and mentally.She is much more relaxed and tolerates being touched more. I feel most of the improvements are result of her experiences that people didl help her when she didn’t feel good! I do want to thank each and every one out there for the Prayers, distant healers and donations! Without you Allegra would not be here today. The total vet bill came to $4300 for !! I am near panic, however I have FAITH that there are more kind hearted people out there, and I do believe in MIRACLES! 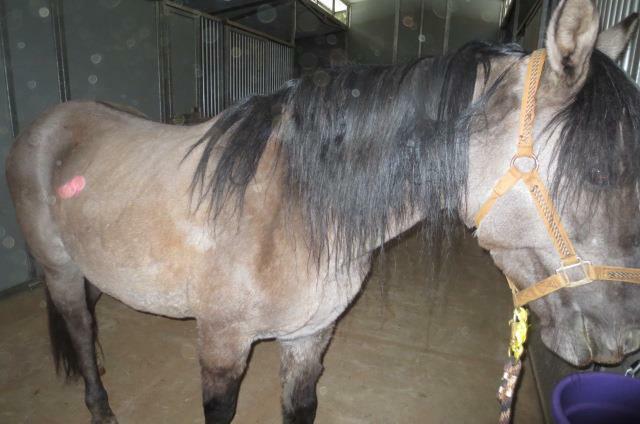 Pingback: Allegra, Spanish Barb Mustang at Wind Horse Foundation needs Donations for Pigeon Fever Infections | We Don't Eat Our Horses and Horse Slaughter is NOT Humane Euthanasia.